These are chairs not only for the jet-lagged and recently arrived to the USA, these are chairs for stylish travellers (possibly even film stars) from the golden age of American passenger railroads and, indeed, Hollywood; swish 1930s Streamline Moderne pieces of public furniture that scream luxury, quality, aspiration and cool adventure (custom-made for the station by the Angelus Furniture Company¹). They are physical manifestations of a lost world in which long distance train travel was the most romantic form of transport conceivable, and yet still an everyday experience. 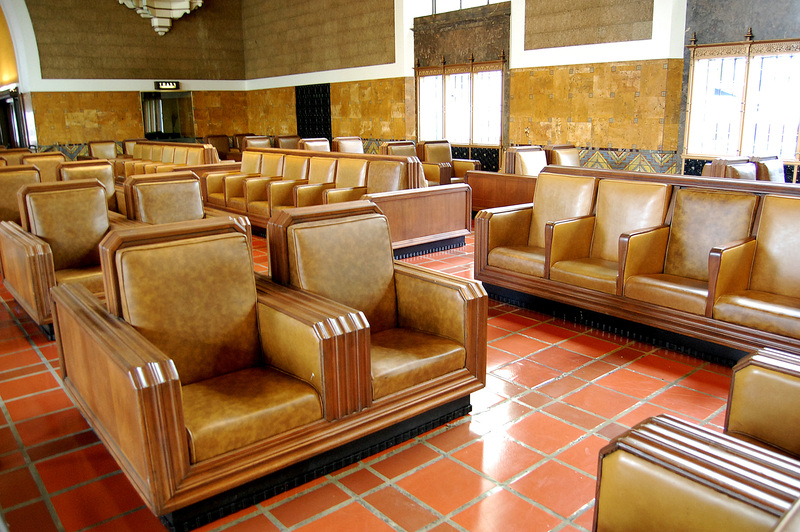 Wood-framed and leather-upholstered, they reside in what, for my money, is the best of all the American union stations: Los Angeles Union Station. Thankfully, when I woke later, my luggage and I remained happily together and unharmed. It’s a very civilised station, and I’m fairly sure that’s in large part due to its civilised architecture. Inside and out, Los Angeles Union Passenger Terminal (to give the station its official name, as per its entry in the National Park Service’s National Register of Historic Places) is an extraordinary blend of Spanish Colonial Revival, Streamline Moderne and Art Deco, remarkable both for its startling design and for its intact survival. 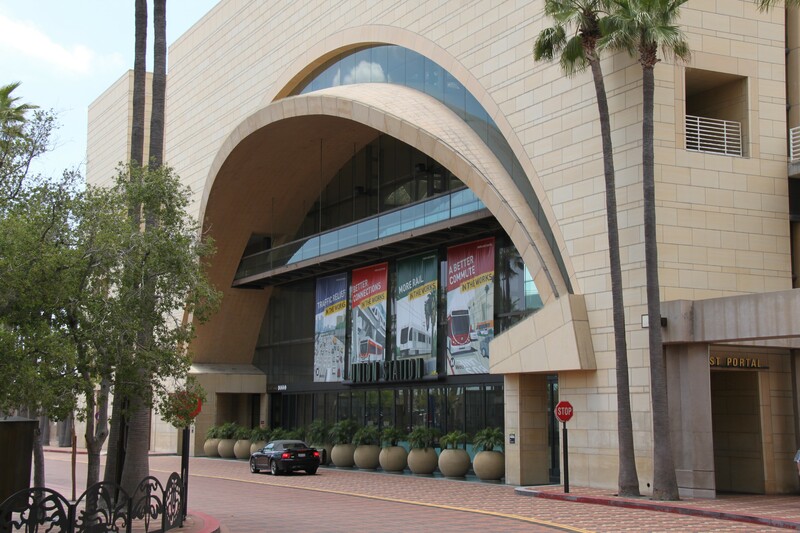 The building’s terracotta roofs, arches, tiling and arcades are very much Spanish Colonial Revival, a style which reflects California’s Spanish history, popular across the state and more locally to be found in the work of architects like Paul Revere Williams. But the chairs, doors, lighting, floor patterns and various other details are either Streamline Moderne or exotically patterned and decorated Art Deco. 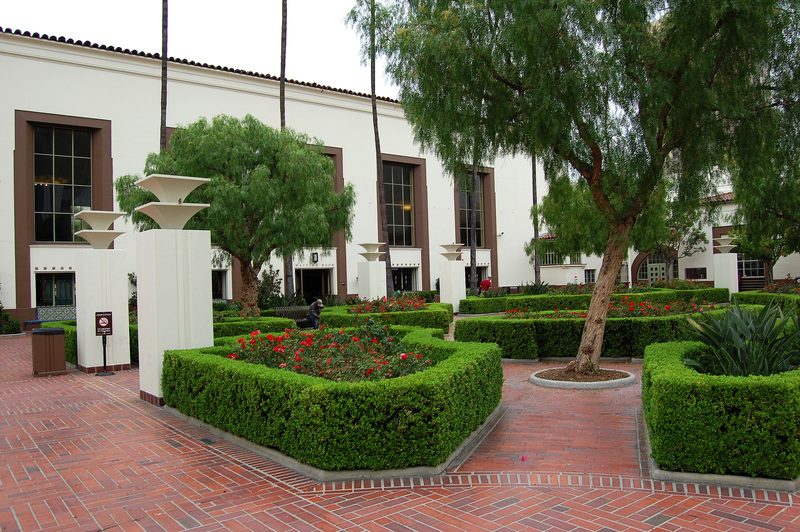 It’s not the only Spanish Colonial Revival station in America (see a picture of Fullerton, here) but it is the only major station in that style. Once through the main doorways, you’re into a square foyer which houses a fabulous information desk, along with the most splendid floor tiles, a feature which runs throughout the station. The red ones are quarry tile, highly polished. The tiles making up the decorative bits of the floor towards the centre comprise marble from the states of Vermont and Tennessee, Belgium, France and Spain, as well as Montana Travertine. The decorative ceramic tiles on the lower parts of the wall are bordered by black marble from Belgium and more travertine². From here, there is a choice of three directions in which to head. Assuming you’re still facing the same direction as you were when coming in through the main entrance doors, take a turn to the left from the information desk and you head into the vast ticket hall, 42m long by 24m wide. 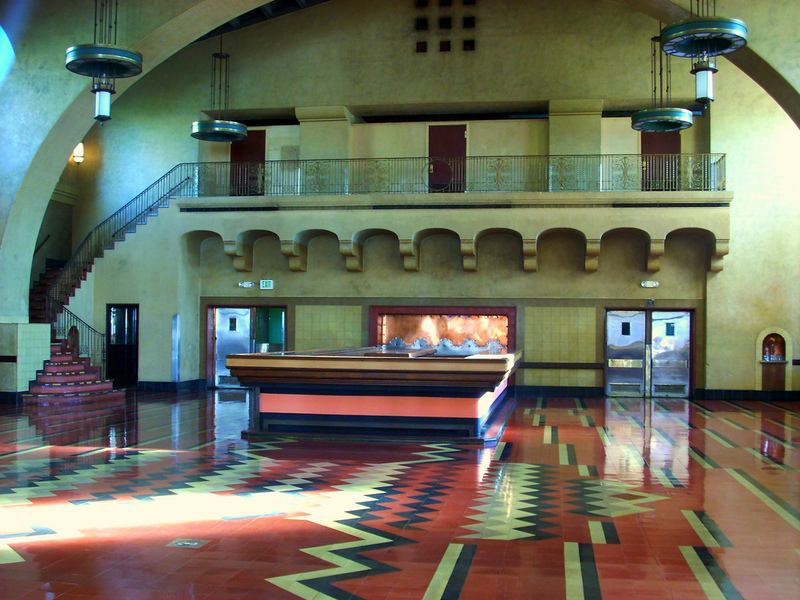 Streamline Moderne ticket booths line one side of the hall, while tall arched windows run down both. The decorative tiling extends up the walls to the height of the doors, and above it the walls are covered in acoustic tiling. It’s one of the things that lends Los Angeles Union Station its air of extraordinary and unexpected tranquility, and is a lesson to architects who are still producing stations and terminals where noises bounce around unchecked, drowning out announcements and unnecessarily adding to the stress of travel. The beams holding up the 15m-high ceiling appear to be wood but are actually painted steel, while the ceiling panels in between are patterned. The huge brass light fittings are proper Art Deco gems. Incredibly, the ticket hall is now essentially unused, and usually roped off, ticketing facilities now being smaller and located elsewhere in the station. Turning right from the information desk in the entrance lobby takes you through a set of doors and into a covered arcade leading to the station’s Harvey House restaurant. 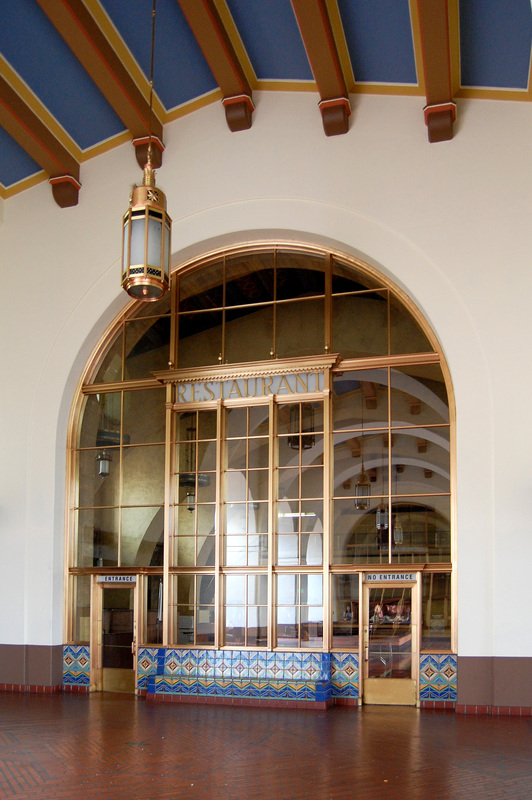 The Fred Harvey Company became a commercial partner of the Santa Fe railway in the late nineteenth century, and established restaurants at many railroad stations, serving good food in high quality surroundings, a quality which is immediately apparent in the Harvey House’s entrance. Now unused, in favour of rather less expansive (and much, much less glamorous) refreshment facilities in the underpass leading to the railroad tracks, the Harvey House restaurant at Los Angeles Union Station still retains many of its Streamline Moderne design features, as well as a balcony and mezzanine floor over the kitchen. It was designed separately from the rest of the station by Mary Colter³, though it fits in seamlessly with the main station buildings. I’ve been to Los Angeles Union Station more than once, and between my latest visit and the one preceding it, the station gained a new entrance/exit on the east side of the railway tracks, in connection with the expansion of Los Angeles’ Metro network (the LA Metro purchased Union Station a few years ago). The new east portal is an interesting modern building designed by architects RAW International. It makes no attempt to pretend to be part of the older structure, but thankfully it fits in with the older building very comfortably nonetheless, evoking the architecture of American union stations without slavishly imitating them. Los Angeles Union Station east portal. Photo © David Humphrey and used with kind permission. David is a fellow fan of Union Station, and there are several of the station by David in this flickr set. 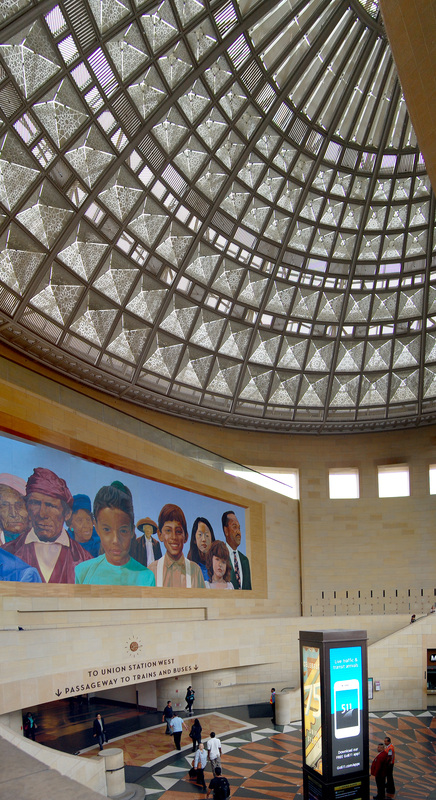 On the inside of the entrance, a huge half-dome skylight with decorative glass panels commands attention. Stairs lead down to an underground level, linking to the passageway that runs under the platforms. 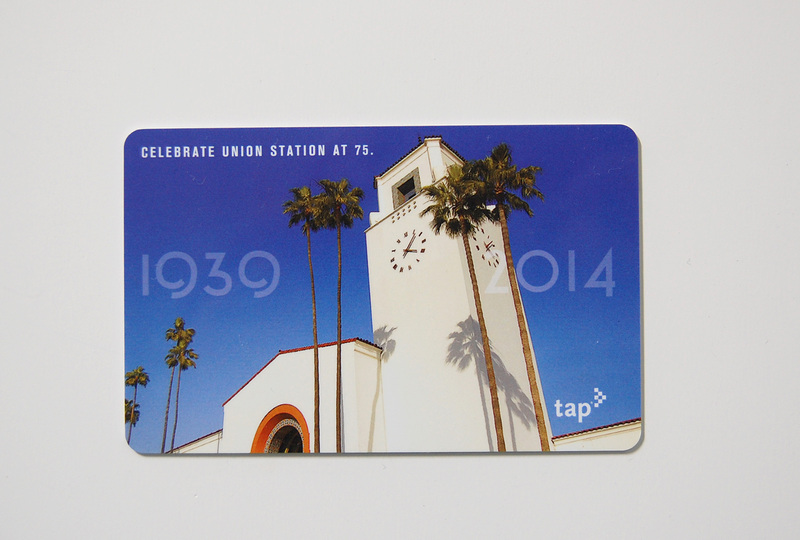 The commemorative Los Angeles Metro “tap” smartcard, celebrating Union Station’s 75th birthday. Photo by Daniel Wright, card design by Metro Los Angeles. 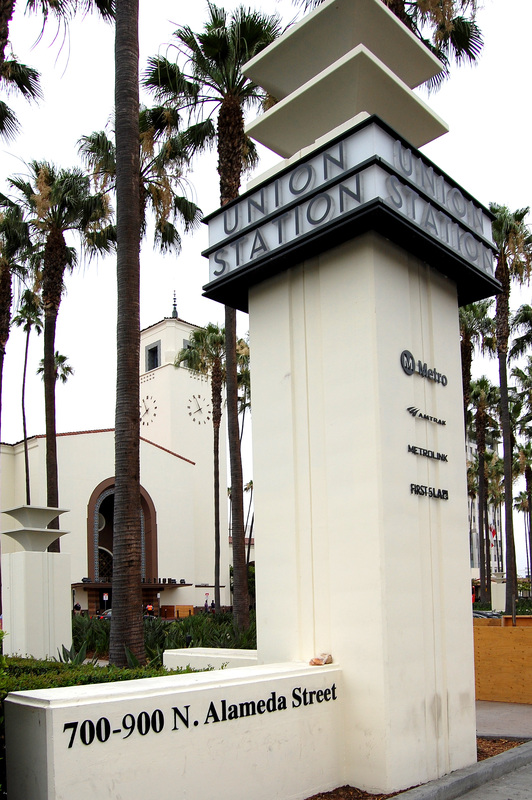 Union Station is such an icon of Los Angeles’ transport system that it makes the perfect illustration for a commemorative tap card, with the particular reason in this case being that it has been 75 years since the station opened. There are two other designs in the same series. The station has permeated wider culture, and has made some memorable recent guest appearances. The climax of the first episode of TV series Marvel’s Agents of SHIELD took place at the station, and it also features in the video for multi-squillion-selling song “Happy” by Pharrell Williams (a track so phenomenally successful and so ubiquitous that it has impinged on even my musical awareness). Pretty well the only thing about Los Angeles Union Station which stops it being perfect is the state of its platforms, which leaves something to be desired. Despite the scruffiness, it is possible to discern the attractive design of the columns holding up the canopies, and the cast lettering above the subway entrances, all of which could sing again if properly restored. Perhaps they’ll be sorted out by my next visit. The only other issue is one which no restoration programme could ever address, which is that the survival of this most beautiful of stations is such a bittersweet reminder of the gulf between mass train travel in the 1930s and mass train travel today that it’s almost unbearably poignant. If you’re not careful, you can end up positively aching for the days when you could catch a glimpse of film stars in the smoke-filled recesses of the Harvey House, scotch on the rocks clinking, before boarding a sleeper train across the moonlit desert to who-knows-where. 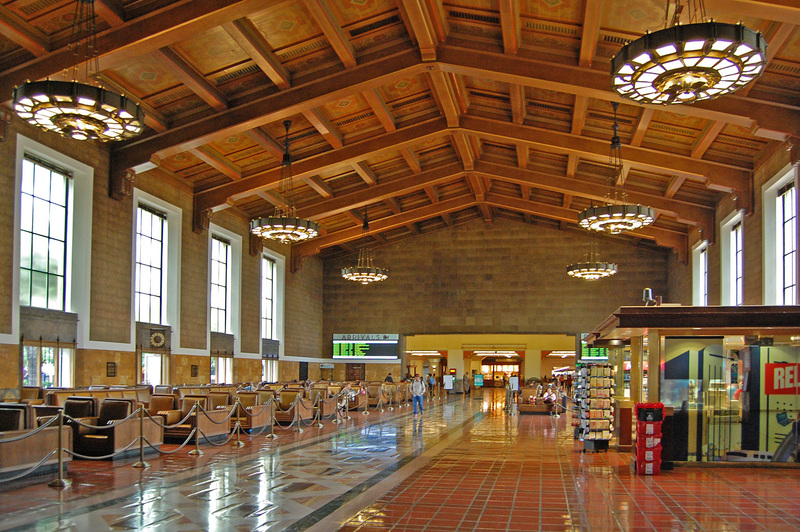 Despite its substantial public profile, Los Angeles Union Station remains the only railroad station in America where I have ever been challenged (assertively but politely, as you’d expect in America) by security personnel who wanted to know why I was taking photographs of the building. They seemed utterly bemused by my explanation that I was a fan of the architecture. At Grand Central Terminal in New York, where you might expect security concerns to be even higher in the minds of staff, no-one seems worried that countless tourists are busy snapping away. It’s what you’d expect in a gorgeous and famous public building which is a tourist attraction in its own right, so it raises no concerns. 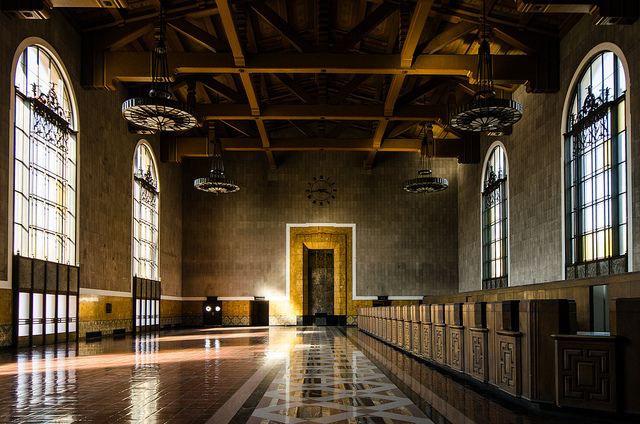 It’s extraordinary that the staff at Los Angeles Union Station don’t seem to expect the same interest from photographers at their station; or perhaps they actually don’t have large numbers of people visiting to take photos. 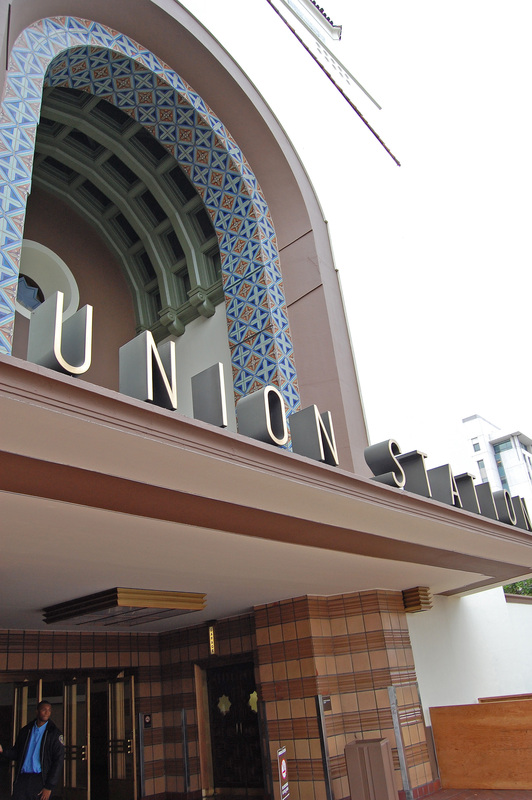 Despite Union Station’s appearance on television and the local smartcard tickets, it just doesn’t seem to be on the Los Angeles tourist trail in the same way, and the staff there just don’t seem to be aware of what a photogenic gem they have on their hands. ¹ An essay on Union Station commissioned by Los Angeles Metro, here. 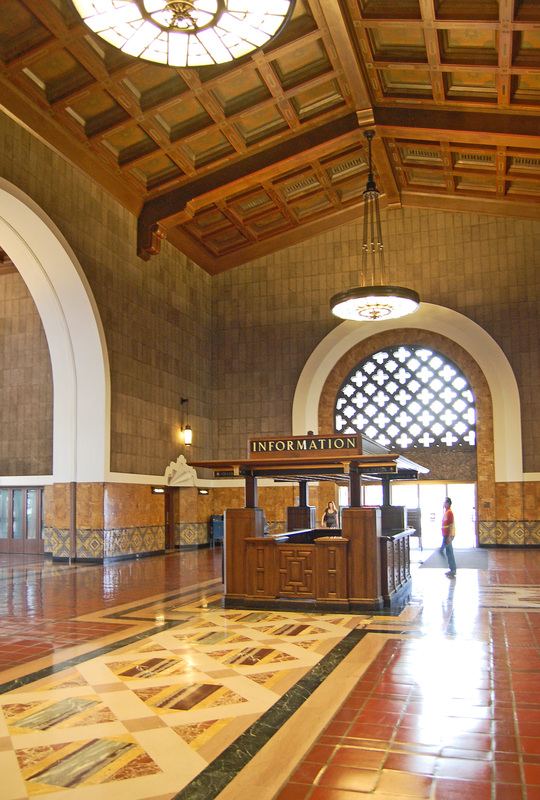 ² National Park Service National Register of Historic Places inventory for Los Angeles Union Passenger Terminal, here (this is the Google web cache version as the actual document on the National Register of Historic Places seems to be unobtainable at the moment). OLIN’s project page for the Patsaouras Transit Plaza, here. RAW International’s project page for Union Station’s east portal, here. ³ A detailed essay on the Harvey House restaurant commissioned by Los Angeles Metro, here. As usual, anything else linked to in the article above will have been read and may well have been regurgitated. I must ask, are you an architect? What has prompted you to develop this site? I originally aspired to be an architect, but the first year at the Oxford School of Architecture proved to both me and the school how wrong that was (!) and I ended up, completely accidentally, (fortuitously? Serendipitously?) going into public transport (City of Oxford Motor Services). Are you in some parallel universe?! Thank you for the kind comment. No, I’m no architect. I ought to put up a biography page for those unfortunate souls who want to know more about me. The short version is that I’ve always been interested in architecture for as long as I can remember, particularly modernist buildings (not that I knew that’s what they were when they first caught my eye), and I’ve also always been interested in transport. I studied transport management at degree level at Aston University, which has a beautiful modernist main building, spoiled by some none-too-sensitive wings added later on. I never would have had the brains to study architecture, so everything on the site is self-taught appreciation, I’m afraid. After graduating, I knew that I didn’t want to do the operations side of transport, and I eventually ended up working as a transport journalist for a few years (an absolute blast, and I made some very good friends who are still in the business and whose work I admire enormously) before working in a local authority’s public transport department for several years. I then went freelance as a transport writer, which gave me the time to start this blog as a personal project. I’ve always been quite convinced that given a bit of thought, transport can simultaneously work well and look good too, enhancing the environment in which it operates. I also think that transport has had a practically unique contribution to wider culture amongst the many industries of the world, which is why the blog sometimes veers away from the built environment to look at transport in books, in films, on TV and so on. Wonderful! Arrived there from Houston in the early 1990’s. I love train travel partly because of the old stations. Union Station is one of my favorites.